A custom-designed and built screen room will offer you and your family a covered outdoor recreational area that will be enjoyed throughout the year. Choose Flowers Aluminum Construction, Inc., to screen in your existing landing, front entry way, garage, atrium or to build you a new screen room addition to your home. Upgrade your home's value with a custom-designed and built glass room; this offers you a complete enclosed inside living area, adding unlimited square footage and endless possibilities to your home. 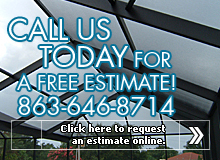 Call us today for more information about our screen and glass room construction services!